PHOENIX(AP) Kobe Bryant had a below-average game. He's got so much help on this Los Angeles Lakers team it didn't matter. Bryant scored 24 points, Vladimir Radmanovic made all five of his 3-pointers and a host of others made significant contributions to help the Lakers past the Phoenix Suns, 105-92 on Thursday night. Bryant shot only 8-of-23, but the Lakers overwhelmed Phoenix with their depth. Six players reached double figures as Los Angeles improved its record to a league-best 9-1. Bryant did make a fourth-quarter cameo, but mostly it was left to the reserves to finish off Phoenix. Radmanovic scored 15, Lamar Odom 13, Jordan Farmar 11, and Andrew Bynum and Trevor Ariza 10 apiece for Los Angeles. Pau Gasol scored only four points but had nine assists and nine rebounds. Amare Stoudemire scored 21 for Phoenix on 9-for-21 shooting. The Lakers' reserves outscored their Suns counterparts 42-30. The Lakers had 21 points off 15 Phoenix turnovers. Los Angeles committed just seven turnovers, resulting in seven points for the Suns. Radmanovic had only five points and was 0-for-2 on 3s in the Lakers' victory over Chicago on Tuesday night. "We'd been kidding him that he'd not made a shot the last week,'' Jackson said. O'Neal added 15 points and nine rebounds against a team he helped win three NBA titles. The Suns' Steve Nash was scoreless in the first half and finished with eight points and 10 assists, leaving the court with back spasms with 4:38 to play. The Lakers made 10 of 21 3-pointers to win in Phoenix for the third straight time. Los Angeles took the lead for good late in the first half. 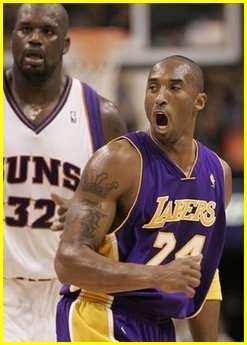 The Lakers led by 14 in the third quarter and were up 89-71 when Odom sank a 3-pointer with 8:34 to play. Phoenix cut the lead to 10 in the final few minutes but got no closer. The Lakers went on a 14-0 run to end the first quarter and start the second, taking a 32-24 lead on Bynum's 10-footer. The Suns responded with a 12-2 spurt to go up 37-34 when Grant Hill made one of two free throws with 7:05 left in the half. Los Angeles, though, outscored Phoenix 17-7 the rest of the quarter to lead 51-44 at the break. The Lakers padded the lead in the opening minutes of the second half. Bryant's fast-break basket made it 63-51 with 7:47 left in the third quarter. The Suns twice cut it to eight before back-to-back 3-pointers by Radmanovic and Derek Fisher gave Los Angeles a 76-62 with 2:21 left in the third. The Lakers led 80-67 entering the fourth. Notes: Radmanovic was 11-for-30 on 3s going into the game. Foul trouble limited Bynum to 20 1/2 minutes. ... Suns coach Terry Porter went with Sean Singletary ahead of Goran Dragic at backup point guard. Both players are rookies. ... O'Neal gave Jackson a big, sweaty hug in the hallway before the game.